This book is precious to me because it was how mother passed on to me her love for art when I was so very young. Grandmother had moved to Chicago to take classes at the Art Institute well before she ever met grandfather. She owned the book originally, and passed it on to mother when mother attended University of Chicago as a Fine Arts/English major. It's mine now but because the pages of this book are so old and brittle, the only way to salvage it to pass it on to someone else is to digitize it here for you. I've added transcriptions to let you search and swipe, and links to connect pictures and descriptions. Books have to be efficient of space, so descriptive text can meander far from what is being described. Because of the natural complexity of that type of organization, reading an art book can often be a brain teaser. For a more logically coherent organization, I've created Chapter Views that connect picture icons with the associated text. 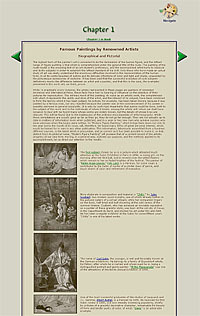 From there, you can link to the larger image. Unfortunately, I can find no logic that determined what Dupont Vicars put in what chapter. If you do, let me know! The book includes two pages of artist names and the page numbers where their work appears. I've expanded that concept to allow you to link to a painting in the book, or link to more about the artist. Once you're on an artist's page, you can page through artists just as you were paging through art. Since this website has grown from childhood memories and love, I've also included a ring of larger images of my favorite pictures. If you're here as a researcher, then you probably have a personal set of links far better than these, but as someone returning to art after 40 years, these are the links I've been impressed enough by to want easy access to refind them. I'd love to hear from you if you have any feedback on the design, or suggestions to make it better. 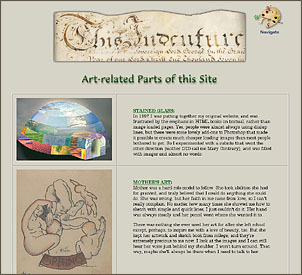 Old art articles from the New York Times archive. 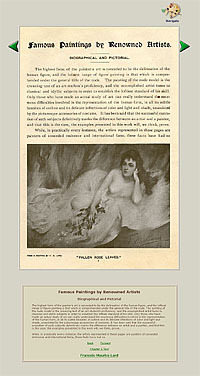 Though mostly a gossip rag about the American art community at the turn of the century, it also contained etchings of paintings by our artists. Recent news articles on art that catch my eye. Leon Herbo No No Cherries or Roses? Adolphe Weisz No Yes It is I! Mother became an English/fine arts major at University of Chicago in 1928 at the age of 17, studying in the studio of Lorado Taft. Art was part of our everyday life. She would smooth the beautiful, black Chicago dirt and draw a few lines - the art deco period, of course - and make me guess what the rest would be. When we went downtown, we would wander slowly through the city streets as she pointed out all the wondrous Chicago architecture. Then we'd go to the Art Institute, where grandmother had studied before she met grandfather, though mother did accuse me of preferring the gift shop. This book is one of my earliest memories and became one of those links to mother that I cherish. Before it was mother's, it was nana's. Her maiden name is written on the inside cover, scratched out and replaced with her married name. But the paper was cheap, and the book that they left for me is falling apart. So I'll save it here and give it to you. In memory of mother and grandmother. And back again laughing in such fine company. Of the lion and the curve and the stroke of the pen. For genetics will conquer in gentle ambush. "I am no artist and I know no verse." Then I listened to silence that laughed in reverse.